I have a secret addition to Buffalo wing sauce. Ironic for a vegetarian, no? The first time I tried anything "Buffalo" flavored was at a neat little vegan place in Pittsburgh called Quiet Storm a few years back. They have some amazing tofu tenders slathered in a Buffalo sauce. They come with a vegan blue cheese dressing that tastes nearly like the real thing. After one tiny bite, I was hooked on Buffalo sauce. Since then I've had the super tasty tofu wings at Melt (they're so good that meat eaters even like them), and in my travels for work, I've tried some really interesting tofu/tempeh/seitan Buffalo wings here, there, and everywhere. They seem to be pretty popular outside of Cleveland...and I can only hope that restaurants in CLE start serving them up sometime soon. Either toss your florets in a large mixing bowl with just enough oil to coat each floret OR lay your florets on the cookie sheet and use your spray oil to coat them. 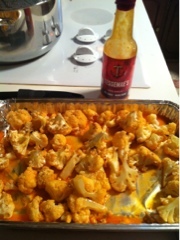 Place cauliflower into a large mixing bowl and toss with the hot sauce. Serve on a tray with celery and carrot sticks and ENJOY !! If you're a Buffalo fan like I am, you will LOVE this recipe. And it's obviously a healthy alternative to deep fried anything slathered in hot sauce. Quick, easy, healthy, and tasty!